Fears from being 5′ nothing! – Journey of Emotions! Fears from being 5′ nothing! Because somedays you just need to laugh! 1. Turning a blind corner and slamming my face into a tall mans belt buckle. 2. Arm pit hair tickling my nose when I hug a man. 3. A 2 liter soda falling on my face trying to retrieve it from grocery store shelf. 4. Grocery store shelf collapsing when climbing it to reach last cereal box in the back of top shelf. 5. Being mistaken for one of them when walking through halls of elementary school. 6. Arthritis developing in my toes due to constant extension to see credit card reader at store. 7. Having to use a booster seat at a movie full of tall people. 8. Getting stopped at entrance to confirm I’m tall enough to get onto the ride. 9. Oxygen mask on a plane doesn’t drop low enough. 10. Having to hem a miniskirt because it reaches my ankles. 11. Only top locker left at the gym. 12. Freakishly tall friend walking around my house on their knees to see the world from my perspective. I can neither confirm nor deny whether these were based on actual true events. A Failure to Communicate with Words! Love this! Thanks for the laugh. 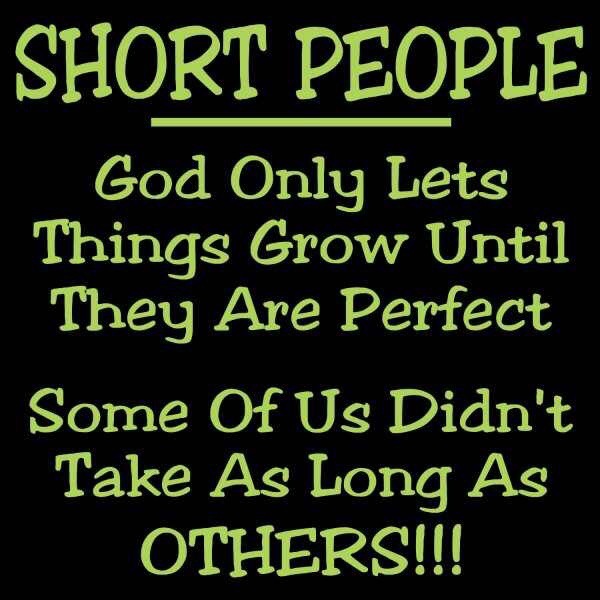 I wonder if that “freakishly tall” person is someone I know…. I can see him doing that.